PULLMAN, Wash. – A critical milestone in solar cell fabrication will help pave the way for solar energy to directly compete with electricity generated by conventional energy sources. Researchers improved the maximum voltage available from a cadmium telluride (CdTe) solar cell, overcoming a practical limit that has been pursued for six decades and is key to improving efficiency. The work is published in the Feb. 29 issue of Nature Energy. The effort was led by the U.S. Department of Energy’s National Renewable Energy Laboratory (NREL) in collaboration with Washington State University and the University of Tennessee. Silicon solar cells represent 90 percent of the solar cell market, but it will be difficult to significantly reduce their manufacturing costs. CdTe solar cells offer a low-cost alternative. They have the lowest carbon footprint in solar technology and perform better than silicon in real world conditions, including in hot, humid weather and under low light. However, until recently, CdTe cells haven’t been as efficient as silicon cells. One key area where CdTe has underperformed is the maximum voltage available from the solar cell, called open-circuit voltage. Limited by the quality of CdTe materials, researchers for the past 60 years were not able to get more than 900 millivolts out of the material, which was considered its practical limit. The research team improved cell voltage by shifting from a standard processing step using cadmium chloride. Instead, they placed a small number of phosphorus atoms on tellurium lattice sites and then carefully formed ideal interfaces between materials with different atomic spacing to complete the solar cell. This approach improved both the CdTe conductivity and carrier lifetime by orders of magnitude, enabling fabrication of CdTe solar cells with an open-circuit voltage breaking the 1-volt barrier for the first time. The innovation establishes new research paths for solar cells to become more efficient and provide electricity at a lower cost than fossil fuels. “It’s a significant milestone. 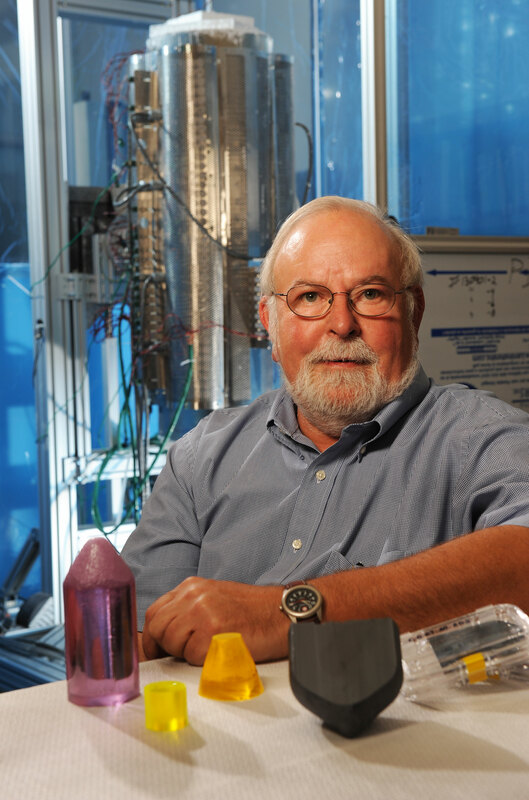 It’s been below 900 millivolts for decades,” said Kelvin Lynn, Regents professor in WSU’s School of Mechanical and Materials Engineering and Department of Physics, who led WSU’s effort. The NREL researchers treated the crystals and built and characterized the solar cells. WSU researchers, including Santosh Swain and Tursun Ablekim, developed the crystal material used in the cells. The WSU researchers grow their crystals in a technique called melt growth, which allows precise control over purity and composition. Purity is critical to the process, so the researchers mix, prepare and vacuum-seal the materials in an industry-standard clean room. They then synthesize the crystal in a furnace above 1100 degrees °C and cool it from the bottom up at a rate of about one millimeter per hour. The crystal is cut into polished wafers to make the solar cells. While researchers have improved silicon-based cells almost to their theoretical limit, there is significant room for efficiency improvements for cadmium telluride, which could be bettered by an additional 30 percent, said Lynn. The research was funded by the Energy Department’s SunShot Initiative (http://energy.gov/eere/sunshot/sunshot-initiative), which aims to make solar cost-competitive with traditional energy sources. The work also was supported in part by Oak Ridge National Laboratory’s Center for Nanophase Materials Sciences. The research is in keeping with Washington State University’s Grand Challenges initiative stimulating research to address some of society’s most complex issues. It is particularly relevant to the challenge of “Sustainable Resources for Society” and its theme of meeting energy needs while protecting the environment.